Marine mammal rescuers in the Hebrides have confirmed the death of 2 long finned pilot whales at Loch Carnan, South Uist. The whales were part of a large group of around 60 whales that prompted fears of a mass stranding in the loch late last week. The main pod now appears to have moved out of the loch into deeper water. The body of the first whale was found and recovered on Saturday. A subsequent post mortem examination suggested the animal died of disease, rather than physical injury as previously speculated in media reports. The remaining whales then disappeared, and experts later confirmed they had left the shallow confines of the loch for deeper water, and appeared to be heading south. A second body was discovered floating in the loch on Sunday, and rescuers believe this animal died outside the loch and was washed in to the shallower water on the incoming tide. High winds in the area hampered attempts to recover the body. “It was too dangerous to recover the body, although another attempt might be made tomorrow [Monday] although it was noted that there seemed to be little damage to the parts that were visible,” Dave Jarvis, from the British Divers Marine Life Rescue (BDMLR) team, told reporters. “Due to its location and orientation, it is thought that the creature probably died elsewhere in the area and floated in on the incoming tide. It is currently impossible to comment on why this animal died,” he said. A week after a similar event in South Uist last year 33 pilot whales mass-stranded on Rutland Island off County Donegal. The Irish Whale and Dolphin Group believes the two events were linked, although they could not show defintively that the same whales were involved. 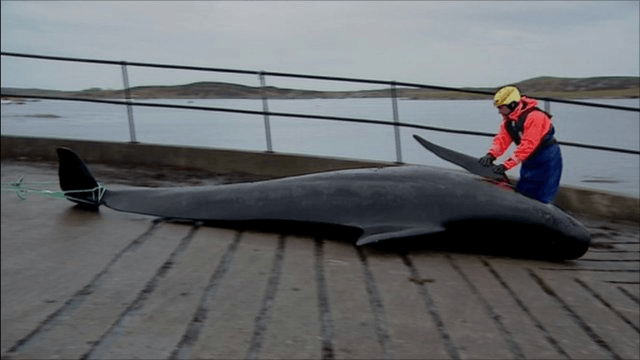 Writing on the IWDG website cetacean specialist Dr. Simon Berrow said they would be monitoring the South Uist situation closely, and calling on members to increase their vigilance.